Mix butternut squash with olive oil, maple syrup, salt, pepper, and thyme and place on a foil lined baking sheet. Bake squash about 20 minutes until tender with caramelized edges. Toast walnuts in a separate pan for about 10 minutes in the same oven. 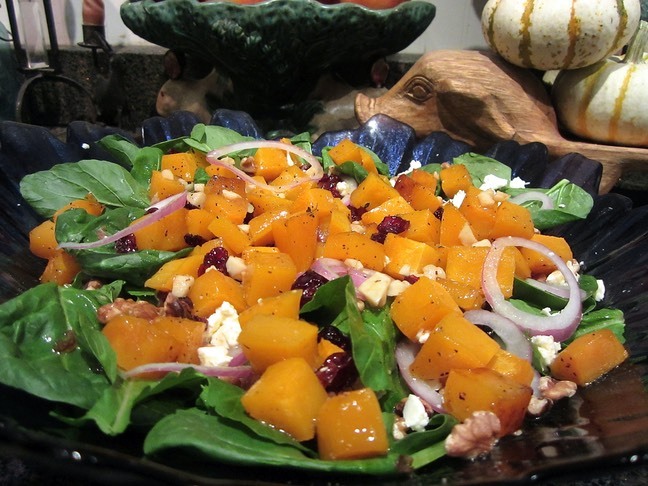 Remove squash and walnuts from oven to cool about 5 to 10 minutes as you assemble the salad. While squash is baking, make dressing. In a small saucepan over medium high heat add apple cider or juice, garlic, vinegar, and salt. Bring to a boil, reduce heat to medium and let simmer for about 10 minutes to reduce slightly. Remove dressing from heat and whisk in mustard and olive oil. In a large salad bowl, combine spinach and arugula and top with red onion and feta cheese. Add squash and walnuts to the salad and toss with enough dressing to coat. Serve immediately and wait for all those YUMS!